Built with a 18-gauge cold rolled steel construction. Its interior is built with a three layer wall and easy to clean heavy duty polished stainless steel. This incubator is equipped with a heated dual pane glass door to help reduce condensation and heat loss during applications. User is able to control precise temperature readings and other parameters like relative humidity and CO2 levels from the digital display. Use of water jacketed incubators are more stable which can be beneficial to vibration sensitive cells, and are less susceptible to exterior environmental fluctuations. 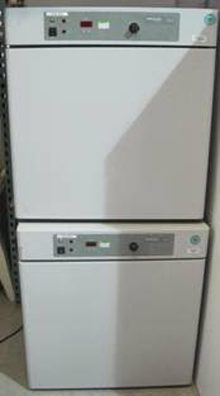 Dual IR stacked water-jacketed CO2 incubator. Microprocessor control maintains and displays temperature and CO2 levels with exceptional precision, stability & uniformity. Patented recovery system with internal air heater and fan restores set-point conditions up to 3 times faster than conventional water-jacketed CO2 incubators. Insulated triple-wall construction and low-power heater in the outer doors keep thermal loss to a minimum while minimizing condensation on the inner glass doors. The Napco microprocessor controlled CO2 incubator maintains and displays chamber temperature and CO2 levels with exceptional precision, stability and uniformity. Features front panel calibration and diagnostics, software lock to prevent inadvertent changing of set-point conditions, audio-visual alarms, low water indicator, automatic shuttle valve to switch to a second CO2 tank when the first is empty, rear access port and auxiliary power outlet and over-temperature safety switch. Chamber is 5.4 cu. ft. The temperature range is 5°C above ambient to 50°C±0.1°C. CO2 range is 0-20%. Designed to provide a clean chamber with removable shelves and unique miter-coved corners that can be easily decontaminated. Continuous chamber circulation through HEPA filter. 3-digit LED display for temperature and CO2. Microprocessor based PID temperature control with over-temperature protection. Large 20 gallon water jacket.